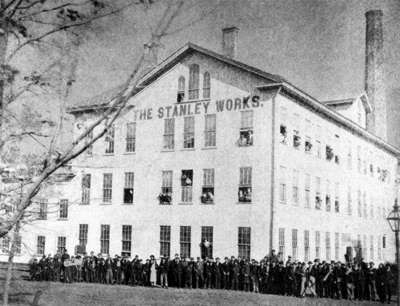 The Stanley company originated as ‘The Stanley Works’, founded by Frederick Stanley in 1843 in New Britain, CT, and eventually incorporated in 1852. They subsequently spun off the ‘Stanley Rule & Level Company’ in 1857. This stood until 1935 when the company reorganized simply as Stanley Tool. After the relationship between Stanley Rule & Level and Leonard Bailey fell apart in 1875, they ended up in court over a patent infringement dispute (which Stanley eventually won) over the designs of Stanley employee Joseph Traut. Bailey returned to plane making on his own and introduced his Defiance and Victor lines. Both of these lines struggled and Stanley ended up buying both in 1880 and 1884 respectively, but then discontinued them by 1888. Leonard Bailey thus retired from plane making and passed away in 1905. In a nod to his contribution to their overwhelming success, or perhaps for branding reasons, Stanley started casting the Bailey name into the beds of their plane bodies around 1906. Regardless of which name is stamped on them, virtually every bench and block plane Stanley made from 1869 forward are all referred to (somewhat generically) as ‘Stanley Bailey’, or simply ‘Stanley’ or ‘Bailey’ – all are technically correct. The Bailey planes comprised Stanley’s basic bench plane line and the company made millions of them. Some (years of manufacture) had the Bailey name stamped into the bed, while others did not. All, however, refer to the various design patents originated by Leonard Bailey, as ‘Bailey’ was never actually part of the Stanley company name. As the patent rights expired late in the 20th century and hand tools began falling out of favor, the Bailey name was eventually dropped from use. Post WWII, the company responded to the changes in demand that slowly shifted from hand tools to power tools. The company also invested heavily in hardware acquisitions and by the late 1960s and early 1970s, focused on the growing ‘do it yourself’ trend among baby boomers. Today, Stanley is a global manufacturer with production facilities in 18 countries, offering a broad range of tools and hardware for home improvement, consumer, industrial, and professional applications. For more information on the company’s history, try FundingUniverse or the New Britain Industrial Museum.